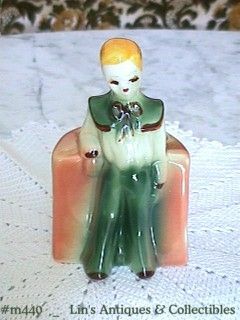 The planter portion is a soft orange/rust color, the boy is "wearing" a light green shirt and dark green color pants. The shirt has brown cuffs, brown trim around collar and a brown bow. He has brown shoes. Planter has a small amount of cream color glaze on bottom but it is not completely glazed. It is in mint, unused condition and is a very pretty planter with excellent colors and attention to detail!